April 03, 2019: The Goa Board of Secondary and Higher Secondary Education has announced the examination dates for its SSC and HSSC exams for 2019. As per the announcement, the Goa HSSC (Class 12) exams will be conducted from 28 February, 2019, and end on 26 March, 2019. The Goa SSC (class 10) exams will be conducted in the month of April and commence from 2 April 2019 and end on 23 April, 2019. The timetable for the SSC exams can be found here and those for the HSSC exams can be found here. In the year 2018, the Goa SSC exam results were announced in May. This year, too, the Goa board result 2019, is expected to be announced around the same time, most probably in the last week of May. As and when this information is available to us via trusted sources and official authorities, we will update you with the exact date and time of the Goa SSC and HSSC results 2019. Other information we release will include name-wise results, pass percentage, number of candidates, gender-wise pass percentage, names of toppers, etc. We published the Goa plus two results and the Goa SSC results for 2019 on our website, examresults.net/Goa/. The results are also announced through the official website of the Goa board. In the year 2019, too, you can access the Goa SSC and HSSC results 2019 via this website. Our Android app, ExamResults, is the perfect way to stay notified of all exam- and results-related notifications and check results. 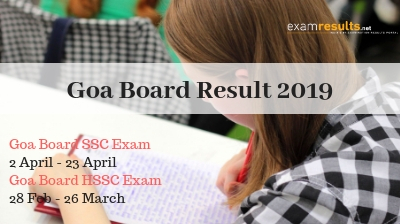 Traditionally, the Goa SSC and HSSC results are announced in April and May. Last year the results were declared on 25th May, 2018 and 27th April, 2018 respectively. There still hasn't been any official confirmation on this but as soon as we have confirmation from the Board’s Alto Betim Office, we will be the first to update you about the GBHSE Exam Results 2019. Around 40 thousand students sat for the HSSC and SSC exams held by the Goa board in 2018. In the year 2018, the overall pass percentage of students who appeared in the SSC exam was 89.6% and for the HSSC exam was 84.6%. In the table below, you can check the pass percentage for the past two years for both, the Goa SSC exam and the Goa HSSC exam. We will update this table with the pass percentage for 2019 once the results for this academic year are out. You can check your Goa Class 10th Results 2019 and Goa Class 12th Board Results 2019 on www.examresults.net website along with the official website of Goa Board, gbshse.gov.in. You can also download our Android app to stay abreast of all the latest exam-related updates and to check your results. The Goa Board of Secondary & Higher Secondary Education (GBSHSE) was founded in 1975 through the Goa, Daman and Diu Secondary and Higher Secondary Education Board Act of 1975. The responsibilities of The Goa Board of Secondary & Higher Secondary Education (GBSHSE) includes implementation of education policies in the GBSHSE affiliated schools and conducting evaluation through annual examination at secondary and higher secondary level. The GBSHSE also conducts the annual board exams for SSC and HSSC students every year in the month of March – April followed by the declaration of Goa Board Result 2019 in the month of April-May.